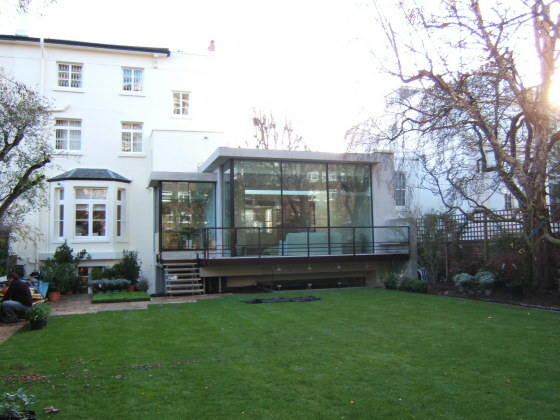 This house extension project in St Johns Wood was completed in 2009. The project involved the demolition of an existing single storey extension and construction of a two storey extension including a new basement between the main house and adjoining property. 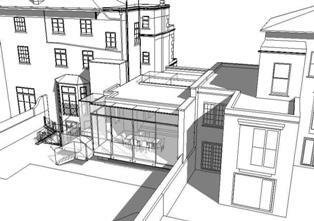 The rear elevation is fully glazed and contains no columns with the roof designed to cantilever over. The ground floor also cantilevers to form a balcony over a feature light-well below. Extensive consideration was given to the party wall issues with the adjacent two storey building and the underpinning and retaining wall requirements. We worked in conjunction with contractor and changed the ground floor structure from traditional timber construction to concrete on metal decking on steelwork beams to suit the contractor’s requirements. The retaining wall to the light-well is cranked in section to allow planting to dress the top surface as it slopes away from the basement.